The following is a list of state highways in the U.S. state of New Jersey. ^ New Jersey Department of Transportation (2009). "Straight Line Diagrams" (PDF). Retrieved November 5, 2010. ^ a b c d e f g h i j k l m "New Road Signs Ready in New Jersey". The New York Times. 1952-12-16. Archived from the original on 2011-07-21. Retrieved 2009-07-20. ^ a b Milepost Log of State Highways (1969 ed.). New Jersey State Highway Department. 1969. ^ "Hoffman Signs 55 Measures". The Courier-News. `. June 2, 1937. p. 11. Retrieved December 13, 2017 – via Newspapers.com. ^ "Stranger Proves He Introduced Buena Road Bill". The Daily Journal. May 20, 1940. p. 4. Retrieved December 13, 2017 – via Newspapers.com. ^ Wagner, Dodie Murphy (October 5, 1983). 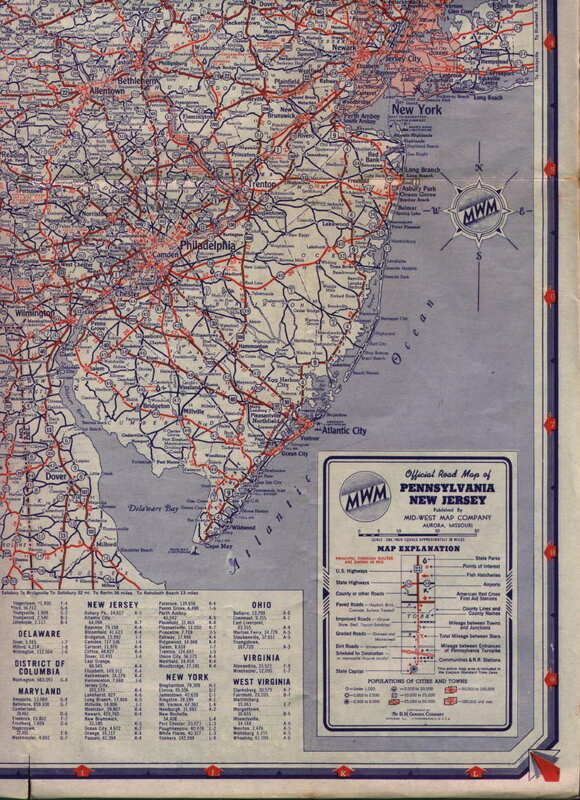 "Vineland–Bridgeton Pike to Become N.J. Route 56". Retrieved December 13, 2017 – via Newspapers.com. ^ New Jersey State Legislature (2007). "New Jersey Permanent Statutes Database". New Jersey State Legislature. Retrieved September 28, 2007. ^ "Road Numbers Changed". The New York Times. New York, New York. March 20, 1942. ^ Route 92-turnpike connection project off the table -- for now: Official says expansion of turnpike between Exits 6 and 9 is the top priority[permanent dead link], Daily Record (Morristown), December 2, 2006. ^ "Gotta Gripe? The Mystery of a Road at Grassy Sound". The Courier-Post. July 20, 1972. p. 3. Retrieved December 13, 2017 – via Newspapers.com. ^ "ROUTE NO. 151. Beginning on Route No. 25 (entrance road) in the vicinity of Cooper river, Camden city, New Jersey, and running thence, via the Camden business center to the Pennsylvania ferry at the foot of Market street and Federal street, Camden city". Trenton, New Jersey: New Jersey State Legislature. 1946: 543. ^ Conte, Michaelangelo (May 17, 2001). "Route 169 Is Now Route 440". The Jersey Journal. Jersey City, New Jersey. ^ "Transfer of jurisdiction: Route 170 in Mansfield Township". Act No. 2218(d) of 1986 (PDF). Archived from the original (PDF) on January 13, 2016. Retrieved July 1, 2013. ^ State of New Jersey, Laws if 1938, Chapter 17.